It's been 1 year since we started the Foodies of Omaha Discussion Board and it was time to celebrate. I know I've been talking about Darwin Bistro a lot here lately, but this time it's not completely my fault. I suggested we go to Darwin for our 1 year anniversary and no one objected. And I assure you, no one was disappointed in the decision. The entire staff stepped up their game and completely blew the doors off all our expectations. To start with, we were greeted at our seats with a small welcome card. The card informed us that the kitchen had prepared a series of small starters for us to begin our meal along with wine pairings! It was a complete, but welcomed surprise. As our guests were arriving, they noticed two young teenage girls at the end of our table. Since our wait staff realized the starters may not agree with their palates, they asked if we would like the kitchen to prepare something special for the girls to start with. Like I was going to say no? The starters were all great and the wines, though not always the best pairing, were all still very enjoyable. The nightly specials were superb and in general, I'd say most of the food coming out of the kitchen was a bit better than normal. This might have had something to do with them having about twice their normal staff on duty, but whatever the cause, I'm not going to complain. Finally, we got 2 other special treats at the end. 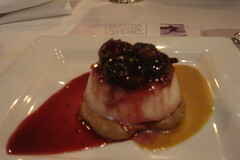 1) Panna Cotta was added to the menu following a suggestion I made a couple of weeks prior. 2) Each guest was given a small box of truffles to take home. So, yeah, Darwin & Co. just killed it as far as I'm concerned. I now have higher expectations for all other restaurants in Omaha. P.S. - I hear they're doing some cool things for their Valentine's Day dinner, but I have other plans that night. If anyone out there goes, bring a camera and send me some pics :-) Same goes for their catering event at WineStyles tonight!